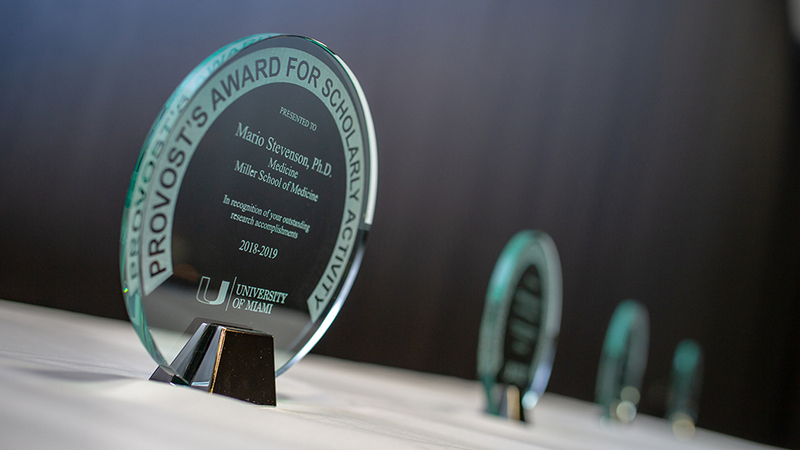 Life-changing discoveries and groundbreaking publications highlight only a portion of the work done by University of Miami faculty. Some faculty achievements are the result of a single matchless accomplishment, while others are the result of many years of dedication and inquiry. The annual Provost’s Award for Scholarly Activity (PASA) recognizes faculty on various scholarly paths who have demonstrated excellence in their field as researchers, gifted teachers, and mentors. “One of the greatest days as a Provost is when we have the opportunity to come together to recognize and celebrate faculty achievements. The faculty achievements we are recognizing today constitute years of exploration and commitment. We are proud of all they have done to contribute to the University,” said Jeffrey Duerk, executive vice president for academic affairs and provost. The PASA award is typically granted to three faculty members each year. This year, because of a tie during the committee's review process, there were four recipients. Congratulations to recipients and nominees for the 2019 Provost’s Award for Scholarly Activity. Learn more about the Provost's Awards.